Over 90 years ago a small group of nuns, Sisters of Loretto, came to Los Angeles from many parts of the country. They came here because they had a vision, a dream of what a Catholic education could mean to the children of Los Angeles. Today, more than 90 years later, their dream has been fulfilled many times over. Coming from another place to start something new can be both inspiring and frightening. I understand this first hand. It is easy to fear the unknown and become doubtful. If anyone doubts a Catholic school, serving inner city Los Angeles, can make a difference, I invite you to visit our school. I didn’t know what to expect when I arrived here from New Orleans, but all that changed with my first Mass and my first visit to the school. It is an exciting, energizing place. We have our challenges, yes; but for over 90 years we have tirelessly worked to eliminate some of the conditions which contribute to persistent poverty in our world. I am very blessed to be at this parish and to have this wonderful school. I invite you all to visit our school soon and see that what I say is true. Come…join with us…pray for us…help us…and support us. Holy Name of Jesus parish has a long and rich history. Holy Name of Jesus Parish started in 1912. It began as a very humble church, in an old frame structure located on Jefferson and Gramercy Place. In 1912, the original building, which was an old wooden structure, was pulled by a team of horse and rolling logs from across the street to the current location. A new building with a school was built in 1924. It was formally established by Bishop John J. Catwell on February 18, 1921. 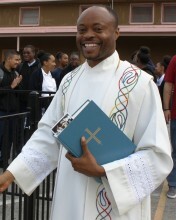 In 1924, the 2nd pastor Fr. Joseph Truxaw, constructed a two-story structure that would serve not only as a church-auditorium, but as a parochial school as well. One hundred and fifty students enrolled in grades one through eight when Holy Name of Jesus School opened its doors in September of that year, 1924. Early accounts describe the new school as up-to-date and fully equipped. However, by 1960, the building no longer conformed to the City of Los Angeles’ rigid building and safety codes, so construction was begun on a new nine-classroom structure. The new building was completed in April 1961, shortly after, the old school was razed. The following year, 1962, the pastor, Fr. Patric J. Roche, completed the replacement of the original plan by adding an auditorium as well as another classroom. A kindergarten program bagan in 1983. Holy Name of Jesus School has been under the direction of a lay principal since the Sisters of Loretto withdrew from the school in June 1978. In 2002 a library was added to the school and in 2003, a music program was implemented.